Maha Saraswati is the knowledge and wisdom of the entire universe. Holding a stringed instrument, Maha Saraswati embodies all facets of knowledge from arts and music to education and language. The embodiment of spiritual wisdom, Maha Saraswati is the enlightened state of the mind. Japa: Practice ten minutes of japa using the mantra Om Aim Saraswatiyai Namaha. Silent Meditation: Sit in silence for fifteen minutes to immerse yourself in the vibration of Maha Saraswati. Listen to the 20 minutes guided meditation recorded by Sai Maa’s Brahmachari, Dayananda, for the third phase of Navaratri. 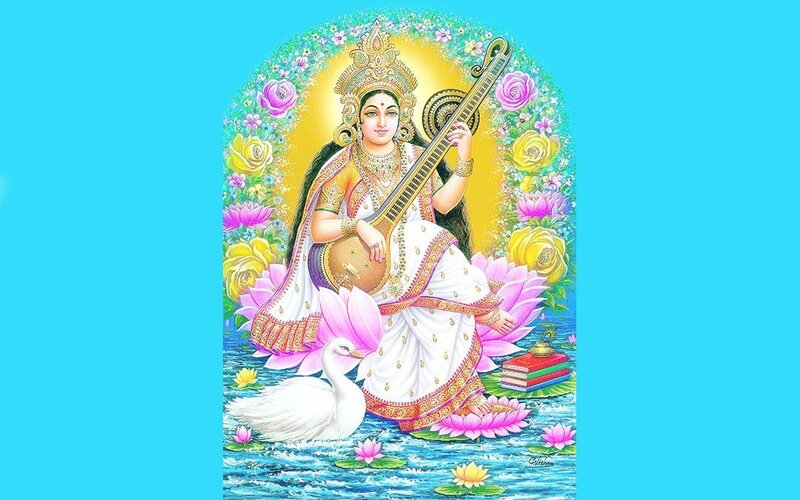 Saraswati, the feminine self of Brahma – the energy, the wisdom, all the powers that he is – will always bless the sincere seekers with her wisdom and powers. The Gayatri mantra comes from her, which is the enlightenment mantra, the most powerful direct application of divine speech. Her Shakti will activate the principles of mind. You see, it is said Brahma is the source of all knowledge. Well, Saraswati is knowledge itself. Again, know she is the essence of the Gayatri. You may have heard the word ‘Maha Vidya’ – again it is Saraswati as great knowledge, transcendent knowledge. To be thirsty, feel that thirst for true spiritual knowledge. Allow the mantra to build the great capacities in your brain, and strengthen your mind as well as your intellect. You must always live with sacred feelings, sacred thoughts, and sacred words. On your tongue, you must put Maha Saraswati [Goddess of Speech]. On your tongue, there must always be words of Divine Love. Are my thoughts based on love or fear, compassion or judgment, freedom or control? Do I go into my heart to find my inner knowledge or wisdom, or spend most of my time in my mind, analyzing and focusing on others and my environment? What spiritual knowledge do I seek, and how do I find it? What teachings, practices, tools, and resources do I have and use to access true spiritual knowledge? How do I most often speak to others? With love and compassion, or fear and judgment? Will I take time to notice my words, tone of voice, body language when I speak, in order to be more loving and authentic? How will I listen differently? What patterns will I change now?